Philadelphia chromosome (Ph) is the genetic hallmark of chronic myeloid leukemia (CML) and is caused by reciprocal translocation between chromosomes 9 and 22 resulting in formation of BCR-ABL fusion protein. The BCR-ABL oncoprotein can vary in size depending on the breakpoint location within the BCR gene. The position of the breakpoint in ABL is consistent at the 5' end of exon a2, while the breakpoint location in BCR can occur at one of three positions namely major-bcr (M-bcr), minor-bcr (m-bcr) and micro-bcr (μ-bcr). The most commonly associated breakpoint with CML is M-bcr in either exon 13 or exon 14, producing splice variant b2a2 or b3a2 respectively. Both splice variants encode for oncoprotein p210 BCR-ABL., If the breakpoint occurs at m-bcr in exon e1, p190 BCR-ABL form of the oncoprotein is encoded. The fusion transcripts of CML can be separated based on the differences in the site of breakpoint and types of BCR-ABL transcripts i.e., b3a2 is larger by 75 base pairs or 25 amino acids than b2a2 and presence of a different amino acids in these i.e., lysine in b3a2 and glutamic acid in b2a2. In Indian population, there is paucity of data regarding distribution of various CML fusion transcripts, clinico-hematological parameters and treatment response. In view of this, we conducted this study in a study group of 400 CML-CP patients to look for the distribution of common fusion transcripts i.e. b3a2 and b2a2, their clinico-hematological profile and impact on treatment outcome in newly diagnosed CML patients treated with Imatinib. This was a retrospective study performed in 400 Ph+ (Philadelphia positive) CML-CP patients attending the Hematology Out Patient Department (OPD) of the AIIMS, New Delhi from 2014 to 2016. CML-CP was diagnosed according to WHO 2008 criteria and confirmed by reverse transcriptase PCR (RT-PCR) for the BCR-ABL fusion transcript. These patients consisted of 260 males and 140 females with median age 37 years. All these patients were started on oral Imatinib 400–800 mg/day (Novartis, Bale, Switzerland). The study was approved by the Institutional Ethics Committee and written informed consent was obtained from all the participants. CML patients in accelerated phase (AP) or blast crisis (BC), chronic myelomonocytic leukemia (CMML) patients and other myeloproliferative disorder patients were excluded from the study. Baseline characteristics of the patients including age, gender, hemoglobin, total leucocyte count (TLC) and platelet count were recorded. Real-time quantitative PCR (RQ-PCR) was performed on peripheral blood every 3–6 months to look for molecular response which was defined as major molecular response (MMR) if the BCR-ABL/ABL ratio was <0.10% on the International Scale [IS]. For performing RT-PCR and RQ-PCR, 10 ml peripheral venous blood was collected in 1.6% EDTA container and RNA was isolated using the commercially available kit (Qaigen miniamp). The concentration of RNA was measured spectrophotometrically using NANODROP (ND-1000 spectrophotometer). cDNA was then synthesized using MuLV reverse transcriptase and other reaction components (Thermo CAT# AB-1453/A), according to the protocol provided by the manufacturer. cDNA quality was checked by amplification of β2 microglobulin gene. cDNA synthesis was followed by multiplex-PCR to detect the fusion transcript. Expected band size was 472 bp for b3a2 and 397 bp for b2a2 transcript [Figure 1]. To assess molecular responses using RQ-PCR, BCR-ABL and internal control transcript levels were quantified using real-time polymerase chain reaction (PCR) Taqman assay. In this assay, ABL gene transcript levels were measured as a reference in each patient sample. To quantify the copy number of the reference ABL and target BCR-ABL fusion gene transcripts in patient samples, standard curves were generated based on the known concentration of plasmid serial dilutions of both ABL and BCR-ABL genes. Using the cycle threshold (Ct) value obtained from real-time PCR, the copy numbers of target and reference genes were calculated in patient samples from the respective standard curves and BCR-ABL transcript levels were expressed as BCR-ABL transcript copies/ABL transcript copies. The calculation of the ratio of specific fusion gene transcript copy number to endogenous ABL copy number provided a normalized quantification of the specific fusion gene independent of the lymphocyte count in each assayed sample and also compensated for variations in the quality of the RNA and for differences in efficiency of reverse transcriptase reactions [Figure 2]. The Chisquare method was applied for comparing obtained BCR-ABL1 variants of the CML patients by gender. Statistical analysis was performed using the STATA 11 (College Station, TX, USA). Chisquare analysis and Fisher exact test were carried out to compare the difference of frequencies between groups of patients. P value of <0.05 was considered statistically significant. The clinico-pathological parameters of the patients are summarized in [Table 1]. Of the 400 CML-CP patients, 260 (65%) were males and 140 (35%) were females (median age 37, range 12–70 years). The overall frequency of b3a2 transcript was observed in 288 (72%) followed by b2a2 in 104 (26%) and hybrid fusion transcript (b3a2 + b2a2) was seen in 8 (2%) cases. Among hematological parameters, 96 (33.3%) b3a2 patients had Hb >10 g/dl and 192 (66.7%) had Hb ≤10 g/dl. For b2a2 patients, 36 (34.6%) patients had Hb >10 g/dl and 68 (65.4%) had Hb ≤10 g/dl. 260 (90.2%) b3a2 patients had TLC >11 × 109/l and 28 (9.8%) had TLC ≤11 × 109/l. For b2a2 patients, 100 (96.1%) patients had TLC >11 × 109/l and 4 (3.9%) had TLC ≤11 × 109/l. 268 (93%) b3a2 patients had platelet count >100 × 109/l and 20 (7%) had platelet count ≤ 100 × 109/l. For b2a2 patients, 92 (88.4%) patients had platelet count >100 × 109/l and 12 (11.6%) had platelet count ≤100 × 109/l. Among the patients with b3a2 transcript, MMR was achieved in 198/288 (68.7%) patients and 90/288 (31.3%) patients failed to achieve MMR after 12 months of Imatinib therapy. Among the patients with b2a2 transcript, 44/104 (42.3%) patients achieved MMR and 60/104 (57.7%) patients failed to achieve MMR after 12 months of Imatinib therapy [Table 1]. CML is suspected in the settings of typical clinical and hematological findings in the form of splenomegaly, peripheral blood smear showing leukocytosis with left shift (myelocyte, metamyelocytes and band forms) and basophilia, hypercellular bone marrow (BM) with granulocytic hyperplasia and reduced leucocyte alkaline phosphatase (LAP) score. The diagnosis is confirmed by molecular diagnostic tests like RT-PCR for BCR-ABL fusion transcript and cytogenetics. There are mixed opinions regarding the molecular response to Imatinib in b3a2 and b2a2 fusion transcripts. In our study we found that better major molecular response (MMR) was attained in b3a2 patients (68.7%) as compared to b2a2 patients (42.3%) (P = 0.001). Our findings are in line with study by Hanfstein et al., Castagnetti et al., Vega-Ruiz et al. and Lucas et al. who reported better MMR in b3a2 patients as compared to b2a2 patients.,,, Italian GIMEMA working party investigated 559 patients on Gleevec treatment and found a significantly shorter time to MMR in the b3a2 group. Vega-Ruiz et al. analyzed 480 patients and found significantly lower BCR-ABL1 levels in the b3a2 group at three, six, and nine months. Lucas et al. investigated 78 patients and showed a faster achievement of CCyR in the b3a2 group, which was explained by a higher kinase activity of b3a2 BCR-ABL1. In conclusion, the frequency of b3a2 transcript was more as compared to b2a2 transcript. MMR was significantly higher in patients with b3a2 transcript as compared to patients with b2a2. Kurzrock R, Gutterman JU, Talpaz M. The molecular genetics of Philadelphia chromosome positive leukemias. N Engl J Med 1988;319:990-8. Kantarjian H, Melo J, Tura S, Giralt S, Talpaz M. Chronic myelogenous leukemia: Disease biology and current and future therapeutic strategies. Hematology 2000;1:90-109. Deininger MW, Goldman JM, Melo JV. The molecular biology of chronic myeloid leukemia. Blood 2000;96:3343-56. Deb P, Chakrabarti P, Chakrabarty S, Aich R, Nath U, Ray SS, et al. Incidence of BCR-ABL transcript variants in patients with chronic myeloid leukemia: Their correlation with presenting features, risk scores and response to treatment with Imatinib Mesylate. Indian J Med Paediatr Oncol 2014;35:26-30. Anand MS, Varma N, Varma S, Rana KS, Malhotra P. Cytogenetic and molecular analyses in adult chronic myelogenous leukaemia patients in north India. Indian J Med Res 2012;135:42-8. Yaghmaie M, Ghaffari SH, Ghavamzadeh A, Alimoghaddam K, Jahani M, Mousavi SA, et al. Frequency of BCR-ABL fusion transcripts in Iranian patients with chronic myeloid leukemia. Arch Iran Med 2008;11:247-51. Mondal BC, Bandyopadhyay A, Majumdar S, Mukhopadhyay A, Chandra S, Chaudhuri U, et al. Molecular profiling of chronic myeloid leukemia in eastern India. Am J Hematol 2006;81:845-9. Goh HG, Hwang JY, Kim SH, Lee YH, Kim YL, Kim DW. Comprehensive analysis of BCR-ABL transcript types in Korean CML patients using a newly developed multiplex RT-PCR. Transl Res 2006;148:249-56. Prejzner W. Relationship of the BCR gene breakpoint and the type of BCR/ABL transcript to clinical course, prognostic indexes and survival in patients with chronic myeloid leukemia. Med Sci Monit 2002;8:193-7. Polampalli S, Choughule A, Negi N, Shinde S, Baisane C, Amre P, et al. Analysis and comparison of clinic-hematological parameters and molecular and cytogenetic response of two BCR/ABL fusion transcripts. Genet Mol Res 2008;7:1138-49. Vega-Ruiz A, Kantarjian H, Shan J, Wierda W, Burger J, Verstovsek S, et al. Better molecular response to Imatinib for patients (pts) with chronic myeloid leukemia (CML) in chronic phase (CP) carrying the b3a2 transcript compared to b2a2. Blood 2007;110:1939-2020. Lomaia EG, Martinkevich IS, Ogorodnikova YS, Lyschov AA, Bogdanov KV, Zaritskey AY. b2a2 Type BCR-ABL transcript chronic myelogenous leukemia (CML) patients in chronic phase (CP) on Glivec achieve complete cytogenetic remission (CCyR) earlier than those with b3a2. Blood 2006;108:4780. Shepherd P, Suffolk R, Halsey J, Allan N. Analysis of molecular breakpoint and m-RNA transcripts in a prospective randomized trial of interferon in chronic myeloid leukaemia: No correlation with clinical features, cytogenetic response, duration of chronic phase, or survival. Br J Haematol 1995;89:546-54. Hanfstein B, Lauseker M, Hehlmann R, Saussele S, Erben P, Dietz C, et al. Distinct characteristics of e13a2versus e14a2 BCR-ABL1 driven chronic myeloid leukemia under first-line therapy with Imatinib. Haematologica 2014;99:1441-7. Castagnetti F, Gugliotta G, Palandri F, Breccia M, Specchia G, Abruzzese E, et al. BCR-ABL fusion transcript do not significantly influence the outcome of chronic myeloid leukemia patients in early chronic phase treated with imatinib Mesylate: A GIMEMA CML WP analysis. ASH Annual Meeting Abstracts 2010;116:1230. Lucas CM, Harris RJ, Giannoudis A, Davies A, Knight K, Watmough SJ, et al. Chronic myeloid leukemia patients with the e13a2 BCR-ABL fusion transcript have inferior responses to Imatinib compared to patients with the e14a2 transcript. Haematologica 2009;94:1362-7.
de Lemos JA, de Oliveira CM, Scerni AC, Bentes AQ, Bentes IR. Differential molecular response of the transcripts B2a2 and B3a2 to Imatinib Mesylate in chronic myeloid leukemia. Genet Mol Res 2005;4:811-8. Hughes TI, Deininger M, Hochhaus A, Banford S, Radich J, Kaeda J, et al. Monitoring CML patients responding to treatment with tyrosine kinase inhibitors: Review and recommendations for harmonizing current methodology for detecting BCR-ABL transcripts and kinase domain mutations and for expressing results. Blood 2006;108:28-37. Gabert J, Beillard E, van der Velden VH, Bi W, Grimwade D, Pallisgaard N, et al. Standardization and quality control studies of 'real-time' quantitative reverse transcriptase polymerase chain reaction of fusion gene transcripts for residual disease detection in leukemia - A Europe Cancer Program. Leukemia 2003;17:2318-57. Ries LAG, Harkins D, Krapcho M, SEER Cancer Statistics Review, 1975-2003. Bethesda: National Cancer Institute; 2006. Iqbal Z. A comprehensive analysis of breakpoint cluster region-abelson fusion oncogene splice variants in chronic myeloid leukemia and their correlation with disease biology. Indian J Hum Genet 2014;20:64-8. Perego RA, Costantini M, Cornacchini G, Gargantini L, Bianchi C, Pungolino E, et al. The possible influences of B2A2 and B3A2 BCR/ABL protein structure on thrombopoiesis in chronic myeloid leukaemia. Eur J Cancer 2000;36:1395-401. 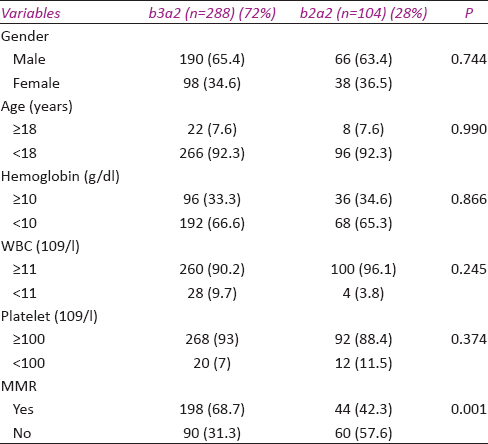 Martínez-Mancilla M, Gutiérrez M, de la Rosa GZ, García-Carrancá A, Gariglio P, Miranda E. Younger age and shorter chronic phase in b2a2-positive chronic myeloid leukemia adults with high white blood cell count at diagnosis. Haematologica 2002;87:666-8. Tefferi A, Bren GD, Wagner KV, Schaid DJ, Ash RC, Thibodeau SN. The location of the Philadelphia chromosomal breakpoint site and prognosis in chronic granulocytic leukemia. Leukemia 1990;4:839-42.